On the 1st April 2016, Apple turned 40. Starting with just 2 people creating the Apple 1 computer in 1976, the company is now classed as one of the world’s most valuable brands. So, how did Apple become the world’s most valuable brand? We could start with looking at the Apple logo, simple and recognisable all over the world. Interestingly, the first Apple logo was not at all similar to the one we are so familiar with now. It was originally a picture of Isaac Newton sitting under an apple tree, inscribed with the following “Newton… a mind forever voyaging through strange seas of thought” with Apple Computer Company on a ribbon banner. This soon changed into the ‘Apple rainbow’ logo, which was more linked with the tagline, “Byte into an Apple”. But as we know, the Apple brand is not solely about the logo. A brand is how your customers perceive you and should reflect in every area of your business, from logo, web design and your customer’s experience. According to BrandZ, Apple has seen its brand value soar from $16bn in 2006, to $247bn last year. A huge increase you will agree! I would argue that it’s their products that set them apart from the rest. But on doing some research there is a real belief that Apple sets trends and stays one step ahead of its competition. The ability to set trends is a key differentiating factor of a brand. Being different allows them to charge a premium, and in turn be rewarded with brand growth, as highlighted above. As Simon Glynn, EMEA director at creative consultancy Lippincott, puts it, Apple “exemplifies the secret of all the best brands”. “Apple creates strong emotional connections that are forged deep inside the business, not just in marketing communications. Apple simplifies the alienating tech world through clear choices with a small range of intuitive and different products; it gives us something to believe in based not only the technology itself but on how we use it in our lives; and it gives us something to belong to when we carry and use Apple technology,” he explains. A great quote that sums up that a world class brand is not made up of one element, but several including products, customer service, marketing communications, web design, a strong logo and constant innovation! 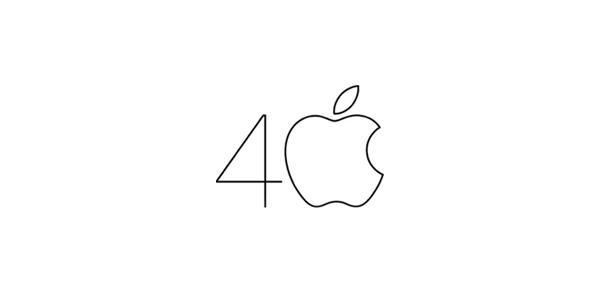 Happy 40 years Apple from all of us at our Farnham office! If you’re interested in looking at your brand, feel free to contact us or call us on 01252 341730 for a chat.